Homeopathy, a branch of drug therapy based on the principle of similars, founded by Samuel Hahnemann (1755–1843) in Germany and since then spread all over the world, has been a controversial system of medicine up to the present. While naturalistic and materialistic approaches have difficulty to find statistical evidence of efficacy and a plausible mechanism of action, scientific research in terms of the humanities may grasp many more aspects of this kind of medical art. 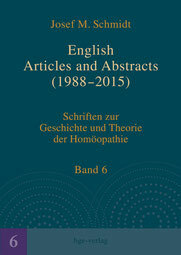 The present volume contains a variety of articles outlining and evaluating homeopathy from a plurality of perspectives, such as philosophy, history and theory of science, history and theory of medicine, social history, history of ideas, institutions, politics, religion, and economics, – thus sheding new light on its status within medicine at large. In addition to these contributions from cultural, human, or moral studies, to complete the methodological spectrum, one of the world’s top-rated randomized clinical trials on homeopathy is presented here. As it turns out, a balanced judgement of homeopathy may require the consideration of more than just a few of its many dimensions. To our Online-Shop, click here!